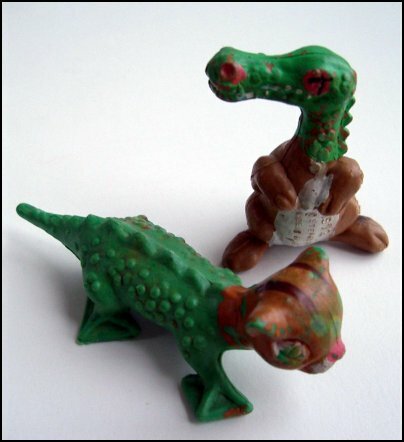 I am searching for an obscure old toy from my youth and perhaps someone here can help me. The figure I am in search of is pictured on the left, but I would love to track down any others from the assortment as well. Information is thus far very elusive on these little critters, but I was able to call the manufacturer and speak to some very friendly and helpful ladies; Janet and Debbie (sorry, I didn't get their last names). Steven Mfg. was initially producing normal plastic zoo and farm animals when, according to Janet and Debbie at Steven Manufacturing in Hermann Mo., a developer who worked at Steven though kids would love it if they were to offer toys of mixed-up animals. I don't know the complete dates of the series' run, but these pictured are dated 1972. The figures were designed in Missouri but produced in China for Steven Mfg. They are solid plastic and about 2-3" tall. They were packaged in an assortment and titled "Mixed Up Zoo Animals" with the Item #1753. The one on the left is called a "Rabbigator", again according to Janet and Debbie. It is as yet unknown how many different animals there were, but Janet believes it to be around 12-24. If you know anything about this toy line including the names of the different characters, or if you have a picture to share please contact Eric or myself.